After months of complaints over stranded patients and late rides that culminated in a class-action lawsuit, Veyo, the state’s non-emergency medical transportation broker, made a case Friday for its improved operations. The company has removed 18 of its underperforming transit providers, its leaders said, placed another 14 on “corrective action” plans, and has introduced monthly reporting scorecards to track progress and hold subcontractors accountable. There are about 80 in its network. Those acts, along with several other attempts to correct a system that came under fierce scrutiny last year for long wait times and failed pick-ups, were part of Veyo’s demonstration to an oversight committee that things were running more smoothly. In its first year, the Medicaid transportation coordinator fielded a seemingly unending string of complaints over missed appointments, hours-long wait times, a shortage of wheelchair vans and other problems. Veyo acknowledged Friday that it was not yet out of the woods, but pointed to its own statistics showing substantial dips in the amount of time it has taken to answer service calls and in the grievance rate compared to the state’s previous transportation broker, LogistiCare. Veyo sought to portray itself as more ambitious than its peers nationwide. “I do believe we’re leading the nation as a broker in terms of setting a new standard for quality, but we still have a ways to go,” said Josh Komenda, president of the San Diego-based company. The presentation to the Council on Medical Assistance Program Oversight Friday was the first time Veyo had come before the committee since legal aid lawyers filed a $33 million class action lawsuit against the state Department of Social Services, which oversees Veyo. Connecticut Legal Services brought the lawsuit in January on behalf of nine patients with illnesses who rely on the transportation network for routine and vital care. 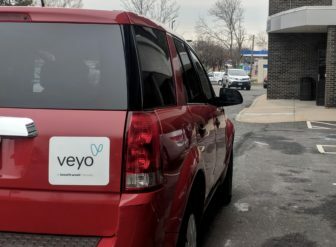 Veyo, which is nearly 16 months into its three-year, multi-million dollar deal with the state, has also been fined $20,000 for breaching its contract by leaving patients stranded or waiting for extensive periods of time. 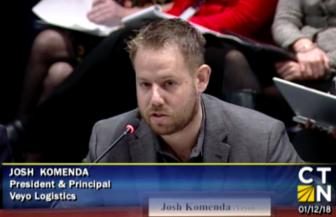 On Friday, Komenda said his team was aggressively scrutinizing Veyo’s missteps and has new initiatives planned for the coming months to streamline operations, including a web portal that provides real-time trip information and contact numbers for each provider. The company also has added 17 new subcontractors to replace those it removed. “Our team is relentless and obsessed with analyzing those failures and figuring out how to prevent them from happening in the future,” he said. Lawmakers and patient advocates on the oversight committee commended Veyo for its improvements but noted that significant issues have persisted, including complaints about the missed and tardy rides. Valerie Wyzykoski, a program manager with the state Office of the Health Care Advocate, said she heard from a Medicaid recipient who was dropped by her medical provider for repeatedly showing up late to appointments. Frustrated by Veyo, the woman now pays for her own transportation. Matthew Barrett, president and CEO of the Connecticut Association of Health Care Facilities, praised the company’s sophisticated technology, but said it needed to focus on its complicated provider network. Rep. Cathy Abercrombie, D-Meriden, a co-chair of the committee, urged Veyo to do a better job in getting bus passes to homeless people and in helping patients with disabilities navigate the company’s voice response system.